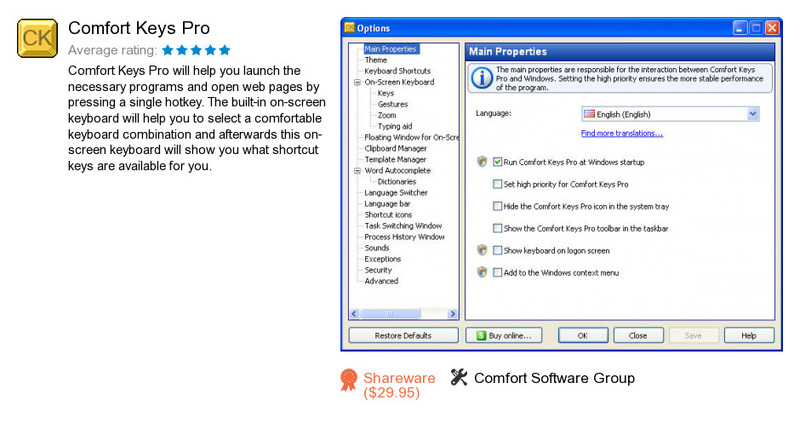 Comfort Keys Pro is an application developed by Comfort Software Group. We know of versions 7.4, 7.3, 7.2, 7.1, 7.0, 5.1, 5.0, 4.3, 4.1, 4.0. Version 7.4.0 is downloadable at our site. Comfort Keys Pro installation package has a size of 6,284,690 bytes. Comfort Software Group also publishes Comfort Clipboard Pro and Comfort On-Screen Keyboard Lite.